Set at the end of a long sea channel, the Golden Tulip Al Jazira Hotel and Resort offers guests a picturesque resort perfect for exploring both Dubai and Abu Dhabi from. 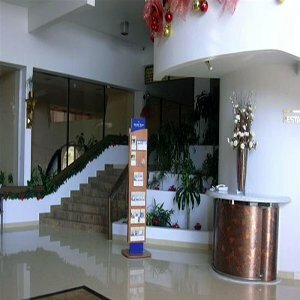 The hotel offers 84 modern, air-conditioned guestrooms with large balconies. Wi-Fi is available in the hotel for a surcharge. Rooms overlook either the pool or gardens. Guests can dine at the hotelâs international restaurant or Turkish restaurant, and a poolside bar serves cocktails and snacks. The hotel offers a number of recreational and relaxation activities, including hiking, cycling, and snorkelling trips, as well as a separate childrenâs pool. The Golden Tulip Al Jazira Hotel and Resort is ideally based for exploring both Abu Dhabi, a 40-minute drive away, and Dubai, with Jumeria only a 20-minute drive away. The Ghantoot Racing and Polo Club is just a km away.A complimentary shuttle is provided to the hotels private beach, and the hotel provides shuttles daily to Dubai and twice a week to Abu Dhabi.Private parking is available, and an airport shuttle can be arranged.